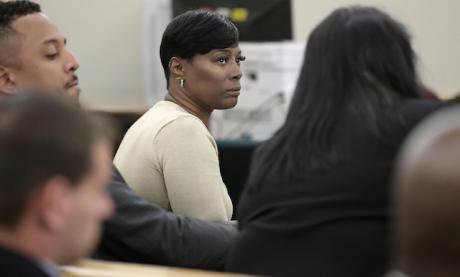 Crystal Mason, middle, sitting at the defense table at Tim Curry Justice Center in Fort Worth, Texas, on May 25, 2018. Max Faulkner/Press Association. All rights reserved. The First Vote. 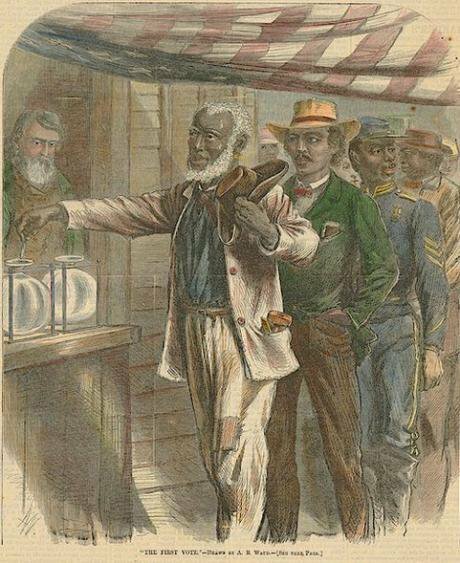 Caption: An 1867 cover of Harper’s Weekly depicted African-American men voting for the first time. Some rights reserved. The end of federal support for Reconstruction in 1877 ushered in the Jim Crow era, wherein southern states waged a relentless campaign of racial terror against empowered black citizens. From the outset, disenfranchising black citizens was a priority: the Black Codes enforced severe penalties for minor ‘crimes’, such as vagrancy, and permanently barred convicted felons from the vote. As these tactics spread, those who imposed them became increasingly brazen about their purpose: in 1884, the Alabama Supreme Court upheld felon disenfranchisement as an effective means to “preserve the purity of the ballot box”. From the outset, disenfranchising black citizens was a priority. VRA. 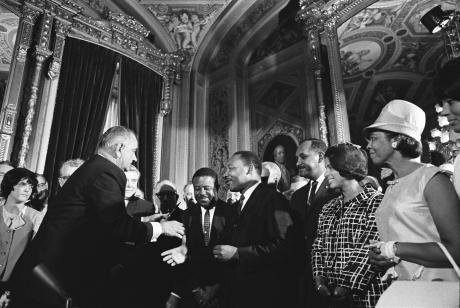 Caption: Martin Luther King, Jr. and other Civil Rights leaders meet Lyndon B. Johnson at the signing of the Voting Rights Act in 1965. Some rights reserved.In April 2010, Shelby County in Alabama filed suit in district court, claiming that Section 5 of the VRA – which established the federal preclearance requirement – was unconstitutional. The district court of Washington, DC ruled against Shelby County in September 2011, and the county appealed. In May 2012, the Court of Appeals in Washington, DC upheld the lower court’s decision. Shelby County then appealed to the U.S. Supreme Court, which agreed to take the case in November 2012. The case was closely watched by civil rights advocates, as well as states and municipalities in South Carolina, Georgia, and Texas that had attempted unsuccessfully to challenge the VRA in the past. Occupy march. Caption: Supporters of Occupy Wall Street joined an NAACP march for voting rights in 2011. Photo by Michael Fleshman. Some rights reserved.Yet voter suppression is often framed in strikingly similar terms: supporters proclaim the importance of democracy, their desire to increase voter turnout, and the franchise as the inalienable right of patriotic citizens. This was evident when lawmakers in North Carolina proposed a new voter ID law in June 2018: House Speaker Tim Moore explained, using terms that few would disagree with, that “protecting our democracy should be one of lawmakers’ highest priorities.” It was voter fraud – not voter suppression – that posed the greater threat to democracy. It was voter fraud – not voter suppression – that posed the greater threat to democracy. The subsequent gains of African-Americans during the Reconstruction era were forcefully overturned only a few years later, to be followed by nearly a century of Jim Crow. Fifty years after the passage of the VRA, the Trump administration, with the acquiescence of the Supreme Court, seems intent on mobilising the state anew to suppress black political power and entrench white supremacy. 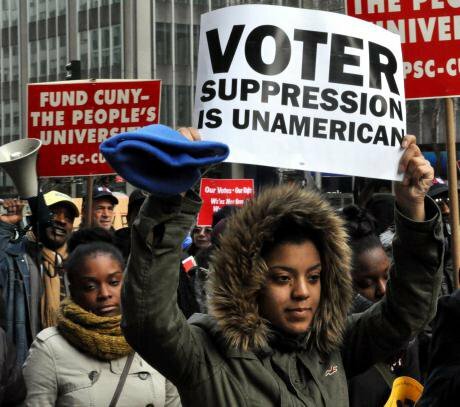 As midterm elections approach, charges of voter suppression are proliferating.